Castle Bruma is on the west side of Bruma. It is the seat of the Countess of Bruma, Countess Narina Carvain. 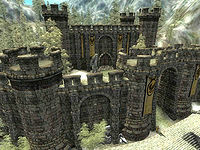 The Castle is divided into The Great Hall, the Service Hall, Castle Bruma Barracks, the Lords Manor, and Castle Bruma Dungeon. Throughout the castle is displayed the Countess' large Akaviri artifacts collection. The main entrance of the Great Hall reveals a large open room. The hallway on the south has a single door to the Lord's manor. The hallway on the north has two doors, the easternmost to the barracks and the westernmost to the dungeon. Through the large archway at the end of the room is the throne room. The two display cases behind the throne are both locked with hard locks; one holds a copy of Messenger's Diary, and the other holds Akaviri Orders and the Draconian Madstone after Lifting the Vale is complete. The unlocked display case in front of the northern fire holds a ruined Akaviri shield. The display case on the other side, locked with a very hard lock, holds three Akaviri katanas. Beyond the throne room is a large dining room with a long table in the middle and two round tables at each end. The middle table seats eight and is set with five strawberries, four cheese wedges, two loaves of bread, two apples, two carrots, two sweetrolls, two ears of corn, a pear, and an onion. The round table at the north end seats two and has two empty place settings, and the table at the south end, which also seats two, is set with two potatoes, a loaf of bread, a cheese wedge, an apple, and a strawberry. The display case on the north wall is locked with a very easy lock and contains a strong potion of insulation, a bottle of Cyrodilic Brandy, and two books; Fall of the Snow Prince and Magic from the Sky. The display case in the southwest corner, also locked with a very easy lock, holds two empty lesser soul gems and a flawed emerald. The door in this corner leads to the service hall. The entrance to the service hall from the Great Hall is on a landing in the middle of a staircase. At the top of the stairs is a door to the Lord's manor. At the bottom of the stairs, a hallway has a door on each side and one at the end that leads into the Lord's manor. The door on the north side of the hallway reveals a bedroom with a double bed on the north wall. The shelf next to it hold only clutter, while a knocked over basket on the floor contains clutter and 800 gold. The table in the southeast corner is set with a loaf of bread, an orange, and three strawberries. On the table in the southwestern corner sits a note. The door on the south side of the hallway leads into another bedroom with a double bed on the east wall. The chest of drawers on the west wall contains clutter, and on top of it a bowl holds three tomatoes, two onions, and a radish. The cupboard on the south wall holds food, and the table in the southwest corner holds a sample of St. Jahn's wort nectar, an orange, and a sweetcake. A bowl on the bookshelf by the door holds ten more strawberries. Upon entering the barracks from the Great Hall, the area to the left, in the southwest corner, is a bar area. On the bar sits two bottles of mead and a bowl that holds four pieces of mutton and a pear. Both cupboards behind the bar contain food, and the bookshelf between them holds two ears of corn, a head of lettuce, and a garlic cluster. The basket on the floor next to it holds seven apples. The two tied sacks next to the cupboard contain clutter, and the tied sack contains food. The basket on the bottom shelf of the shelves beside the door to the dungeon holds five carrots, and a bottle of mead is on the floor in front of it. One of the two tables in the middle of the room holds two pears. The shelves near the training dummy holds three leather helmets, three leather cuirasses, two Bruma Cuirasses, and a pair of leather gauntlets. The weapons rack next to it holds four iron shortswords. Ten single beds line the walls of this room, and a clutter chest sits at the foot of each. Near the eastern wall, on the floor, a rare love letter can be found. The door into the Lord's manor from the Great Hall reveals a large entry room with stairs in the middle. The two tables on the east side of the room each hold a dish with a cheese wedge. The door in the southwest corner leads into the service hall. At the top of the stairs, both doors on the balcony lead into the same foyer with three doors; one on the north, one on the south, and one on the west. The door on the north reveals Tolgan's bedroom, with a double bed in the northwest corner. The table at the foot of the bed is set with a loaf of bread, a cheese wedge, and a bottle of Surilie Brothers Wine. Seven pieces of gold are also sitting on the table. The desk in the southeast corner contains only clutter and an apple on top, and a clutter chest sits next to it. A nirnroot sits on top of the bookshelf in the northeast corner and on the shelves sits a pair of gold trimmed shoes The door on the south of the foyer leads into Yvara Channitte's bedroom with a double bed in the southwest corner. The table in the southeast corner holds a variety of items; a potion of warmth, a bottle of Cyrodilic brandy, wormwood leaves, tiger lily nectar, a motherwort sprig, a sweetroll, a recipe and a mortar and pestle. On the shelves in the northeast corner sit a retort and a clutter sack, with a clutter chest on the floor next to it. On the shelves next to the door the alchemy apparatus set is complete with an alembic and a calcinator. Through the door on the west wall of the foyer is the Countess' bedroom, with her double bed in the southern end of the room. The cupboard in the southeast corner contains clothing, and a jewelry chest sits on top of it. On the desk in the center of the room is a copy of How Orsinium Passed to the Orcs (a heavy armor skill book). The two cupboards in the southwest corner contain food and drinks. The table in the northwest corner holds another cheese wedge and a bottle of cheap wine. On the shelves behind the table a lectern contains clutter, and a steel cuirass sits on the shelf next to it. The cupboard in the northeast corner also contains clutter, and the door next to it leads to the service hall. Lords Manor is off limits to the player and if caught there, the player will be arrested without the usual warnings that they should leave. The dungeon entrance from the Great Hall reveals a room with a table in the middle. A chest of drawers on the west wall contains clothing, and the chest on top of it contains clutter, as does the covered bowl on the bookshelf next to it. The two tied sacks in the northwest corner contain clutter, and the untied sack next to them contains food. The cupboard in the northeast corner contains food, and a Bruma shield leans against the doorway in this corner. Through the doorway, a small bedroom features a single bed in the northwest corner. The chest of drawers beside the bed contains clutter, and on top of it sits a silver longsword. The shelves on the north wall holds a guard helmet, steel gauntlets, and steel greaves. The barrel in the northeast corner contains clutter and minor loot. A hallway in the southeast corner of the entrance room leads to a door to the barracks, and further to a set of stairs leading down. At the bottom of the stairs, the Bruma Jailor is seated behind a table and the shelves behind him hold a covered bowl with clutter and three guard helmets. The cupboard next to it contains food and the evidence chest on the south wall stores stolen goods. The hallway leading down in the southwest corner leads to a doorway; through the doorway is a large room with two bloodstained tables in the middle. The small table between these two holds calipers, tongs, an iron war axe, and an iron dagger. The barrel in the southeast corner holds food. There are four cells here; two on the west wall, one on the south wall, and one on the east wall. The first on the west wall holds a bedroll and a food barrel, the second only a bedroll. The cell on the south wall also contains nothing more than a single bedroll. In the larger cell on the east wall are two bedrolls and a food barrel. The Defense of Bruma: Let a Great Oblivion Gate open outside of Bruma. Buying a house in Bruma: Purchase a large house in the traditional style of Bruma. Esta página foi modificada pela última vez à(s) 04h30min de 9 de agosto de 2013.